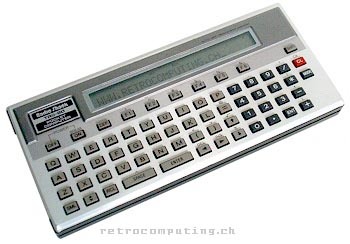 After the success of the TRS-80 Pocket Computer (a.k.a. TRS-80 PC-1), Sharp also manufactured their PC-1500 (see there for more technical information) in a version for Tandy Radio Shack. This machine was marketed as the TRS-80 PC-2 (catalog number 26-3601). Internally, it was exactly the same machine. Only the front face design had been changed: the keyboard layout was different, with an additional enter key, and the display had been shifted to the right. Moreover, the colour style was also slightly different, with a light gray instead of brown back of the case. Some peripherals supplied by Tandy were the "docking station" with 4 colour pen plotter and cassette interface (catalog number 26-3605), 4 and 8 KB RAM module (26-3615 and 26-3616), an external tape interface (26-3605) and an RS-232 interface (26-3612). Of course, all peripherals developed for the Sharp PC-1500 could also be used. see more Tandy Radio Shack TRS 80 PC-2 Ebay auctions !